Typically, any open project files are shown in the Use Resources From list in the Share Resources dialog box. Sharer files are the exception, however. You are never given the choice to use a sharer file as a resource pool. You can now work with your project file and the resources as usual, including assigning resources from the pool to tasks. Be sure to save both the sharer file and the resource pool file because you're saving the link between the two. You're also saving any resource information from your sharer file as additional resources in the resource pool. Note You can make a regular project file into a resource pool file. 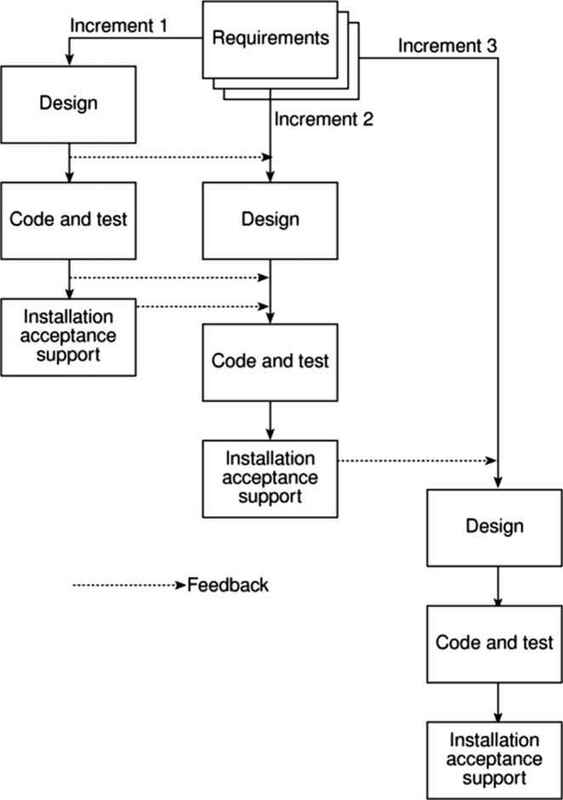 Open the project file you want to use as a resource pool file. Also open the project file that is to become the sharer file. In the sharer file, click Tools, Resource Sharing, Share Resources. 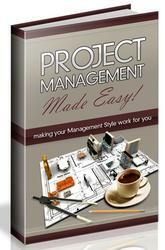 Select the Use Resources option and then select the other project file in the From list. Although making a regular project file into a resource pool can be convenient at first, keep in mind that when the project ends, the assignments will still be a part of the resource pool file, even though they're no longer relevant. The next time you open your sharer file, you'll be prompted to open the resource pool also (see Figure 14-16). This file shares resources from a resource pool. What do you want to do? (* Open resource pool to see assignments across all sharer Files. C Do not open other files. Figure 14-16. If you choose to open the resource file, you'll be able to see all resources, including their assignments, in your sharer file. Click OK to open the resource file. It's opened with read-only privileges. If you select the Do Not Open Other Files option, the resources you're using from the resource pool do not appear. If you open a resource pool file before opening any of its sharer files, you are prompted to select whether you want read-only or read-write privileges in the resource pool file (see Figure 14-17). Figure 14-17. You see this alert whenever you directly open a resource pool file. Specify whether you want to open the resource pool as read-only or read-write. Select the first option to open the resource pool as a read-only file. This is the default, and you should use this option in most cases. You can still update assignment information when working with a read-only resource pool. 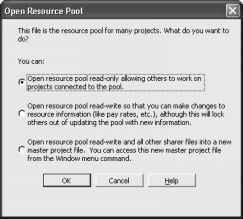 Select the second option to open the resource pool as a read-write file. Choose this option when you need to explicitly change basic resource information such as cost or group information. Only one user can open a resource pool as a read-write at a time. Select the third option to open the resource pool as a read-write file along with all of its sharer files. These files will be combined into a master project file. Display the Resource Usage view or the Resource Graph in the resource pool file to check the availability of resources across all sharer projects. In these views, you can see all the assignments for all the resources in the resource pool. You can see the amount of time they're assigned, if they're overallocated, or if they have time available to take on more assignments. For more information about checking resource allocation, see "Monitoring and Adjusting Resource Workload" on page 345.